Ihsan, the Honey-tongued King of Sharakhai, looked up from his desk and found the gaunt form of Tolovan, his vizir these past three decades, standing at the door. Ihsan nodded, and Tolovan turned and left, his long indigo abaya trailing behind him. Ihsan dipped his quill into the ink-stained well near the ledger that was open before him and finished penning the last of the morning’s appointments. From an aged bronze well, he scooped a small handful of fine white salt and sprinkled it over the still-damp page. When it dried, he lifted the ledger, forcing the salt into the gutter between the pages, then tilted it, pouring the grains into another, nearly empty well. This salt, stained gray from the black ink, he would use later, with his meals. The notion that he supped upon his words was not merely a comfort. It gave him a sense that they were a compact, an agreement between himself and his own past. It was why he was so very meticulous about recording his days, his plans, his meetings with the other Kings, and so much more. And yet, before he rose, he made no entry for this coming meeting, nor would he do so later when he’d returned to his apartments. From the eyes of god and man alike are some things best left hidden. With his thread-of-gold thawb barely brushing the travertine floor, he made his way to the ground floor. There two doors were opened for him, allowing him entrance to the wide veranda that overlooked Sharakhai’s southwestern quarter and the endless desert beyond. Only one table was set out. A table with two chairs. A sturdy man with a trim beard and moustache stood beside one of them. Mihir Halim’ava al Kadri, son of Shaikh Halim, Lord of the Burning Hands. Mihir wore a red turban, a thing forbidden to the populace of Sharakhai but overlooked for the visiting son of a desert shaikh. Orange tattoos marked the olive skin along the bridge of his nose, his chin and cheeks as well, and especially the palms of his hands. Unlike the other tribes, the Kadri left the backs of their hands unadorned, marking their palms instead. When Mihir saw Ihsan approaching, he bowed, and then raised his open hands toward Ihsan. When we come in peace, the gesture said, you may read our tales, but when we come for war, we reveal nothing, for our palms will grip our blades. It was a gesture that stood in stark contrast to his red turban, which, while in the past might have indicated a man preparing to tread the paths of war, had changed in recent decades to one of almost childlike impudence. To the shaikhs and their emissaries it meant that they stood apart from Sharakhai, that no yoke rested across their shoulders, but to Ihsan it looked as though Mihir were clinging to a lonely rock in a storm-swept sea. “Tauriyat welcomes you,” Ihsan said, bowing his head in return. 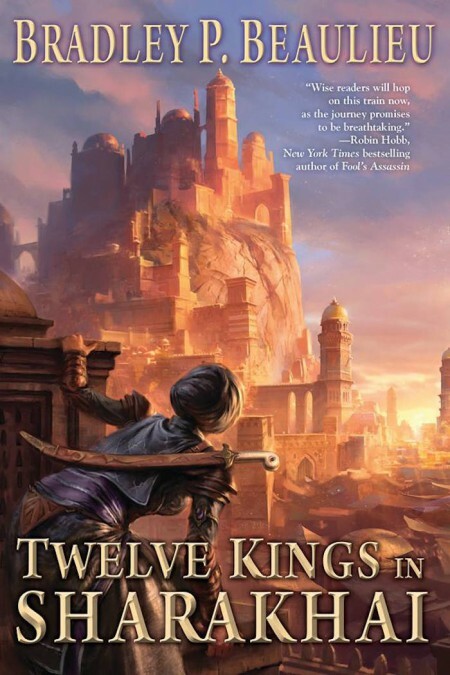 “Hardly the King.” Ihsan took the open seat and gave one quick wave of his hand for Mihir to take his. When Mihir sat, Ihsan gestured toward the doors, and immediately servants came bearing platters filled with grapes and pickled vegetables and grilled flatbread and smoked goat cheese — a fresh import from Qaimir — and bowls of hummus and herbed olive oil and a paprika-dusted eggplant puree that the kitchen knew Ihsan was favoring of late. Glasses were filled with a yellow tomato juice, filtered thrice so that it was crystal clear and glinted in the summer sun. As a box of deep-grained wood was opened, Mihir’s eyes widened. The servant used a pair of silver tongs to lift chunks of ice from the confines of the box and drop them delicately into the glasses of juice. “More?” Ihsan asked when the servant had half-filled his glass with ice. “No, thank you,” Mihir was forced to say, lest he look like a desert dog who’d never seen ice. Which he probably hadn’t. But clearly appearances must be maintained. For a time the two of them ate and looked out over the city. The sounds of Sharakhai came to them — immense crowds, a ringing bell, hammers on stone — but it was soft, as if the city were apart from Ihsan’s veranda, separated by the veil of dreams. Industry, Ihsan thought. Growth. How different from the world Mihir must be used to. He came from the desert and a nomadic lifestyle, moving from place to place to place, each dictated by centuries of tradition and war and the occasional whim of their shaikh. It was a life as foreign to Sharakhai as the strange, crescent-shaped fruit Ihsan was eating. And yet young Mihir had come with news of the Amber City, or to be more precise, with news that might affect Sharakhai, as Mihir’s father had put it when he’d requested this meeting. Mihir seemed nervous. He seemed to want to be about his business, but Ihsan waited until they’d had their fill. He would not give Mihir the impression that he was eager for his news, whatever it might be. At best he would be ceding ground for no gain; at worst it would be tipping his hand. “And how fare the Kadri?” Ihsan asked as he stared out to the desert. Well beyond the borders of Sharakhai, a sandstorm was rising. It looked to be headed this way. Without taking his eyes from the horizon, Ihsan waved his hand as if what he’d granted them was nothing. In the grand scheme of things, it was anything but. It was a promise. A promise the Kadri and three other shaikhs had made with the Kings of Sharakhai, to accept ships and horses and steel and the smaller trade routes it was no longer practical to police. 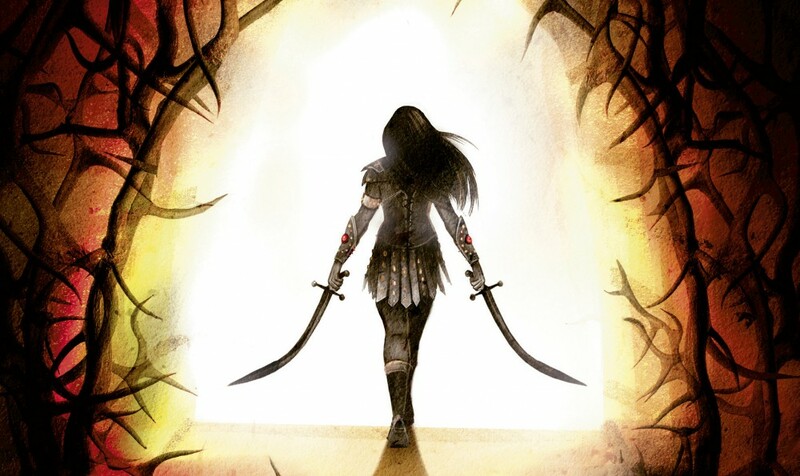 The Blade Maidens had a hard enough time watching the primary trade routes for pirates and delivering the Kings’ justice to those they caught, to say nothing of the smaller trails that led into the Shangazi from Kundhun and Malasan especially. The prime concern of the Kings over the past few decades had been ensuring that caravans could not bypass Sharakhai or the few caravanserais that could collect taxes. And a fine job we’re doing of it. The asirim, so tightly controlled in centuries past, were straining at their leashes. Some would bow to the will of the Blade Maidens only when King Mesut, the Jackal King, Lord of the Asirim, intervened. Some few had still refused, a thing that had never happened before. They’d been killed, of course, but it all made policing the pirate paths through the desert ever more difficult. One can die from desert storms, Ihsan remembered thinking. The Shangazi is not nearly so tenderhearted as you might wish us to think. Like the leaves of an acacia blowing over the tops of the dunes, it had been these signs, and dozens more, that Ihsan had seen. And they worried him. Sharakhai would no longer be able to control the borders as they had two centuries ago, or even two decades ago. So why not turn it to their advantage? Why not draw some of the shaikhs to their side and make it look as though the Kings were magnanimous. It had worked better than he could have hoped. This very meeting was a prime example. Even two years ago, a shaikh would never have sent his son to deal with the Kings. He would have sent a vizir, and they would have demanded the Kings’ envoy meet them out on the vast pan of the desert. But here was Mihir, meeting with one of the Kings, perhaps not entirely trusting but willing to extend his hand in an offer of peaceable and mutual gain. And with even a small handful now willing to do so, the other tribes would, at the very least, give pause when considering whether to harm the interests of the Kings. Across the table, Mihir downed the last of his drink, closing his eyes for a moment as the chill liquid coursed down his throat. Then he turned to Ihsan, his hand still lingering on his empty glass. Here it comes at last, Ihsan said to himself. “The Moonless Host?” Ihsan asked. Mihir nodded, clearly embarrassed. Not, Ihsan was sure, because that growing opposition included many from the Kadri tribe. No, it was because years ago Mihir might have joined them. Ihsan could see it in his eyes, the fire behind them, the rage at being sent here to treat with the Kings when he wasn’t entirely sure he didn’t want to draw a knife across Ihsan’s throat. Do they not? Ihsan thought. A dozen years ago, King Husamettín, the King of Swords and Lord of the Maidens, had taken five hands of Blade Maidens, twenty five in all, and a dozen asirim to put down a series of continued attacks against the northwestern caravanserais. He had followed their trail, and it had led him to a large encampment of three tribes, the Burning Hands among them. Husamettín had not been kind. Mihir’s mother, Syahla, had been wounded — a scratch from the blackened nails of one of the asirim — and had died a slow and painful death. Halim had come to the Kings, begging for a draught that might help her, an elixir, a salve, a laying of hands from one of the Matrons from the House of Maidens, or even from one of the Kings themselves. Ihsan had seen him and had refused his request, not once, but three times. Halim’s eyes had been fire that day, but in time, as Ihsan had seen, the fire burned out of him, such that when Ihsan had approached him, Halim had been grudgingly receptive, and then open to a treaty with Sharakhai. How he’d convinced his people to follow, Ihsan had no idea, but he could see from Mihir that it had not been easy. “And what did they find, these men?” Ihsan asked, leaning back in his chair and staring up at Mihir with a calm every bit as cool as the drinks they’d just enjoyed. At this Mihir gave Ihsan a half bow with one fist cupped in the opposite hand, not a declaration of outright hostility, but certainly its distant cousin. It was so far removed from the expression of greeting he’d used earlier — palms outward — that Ihsan nearly smiled. It seemed there was fire in young Mihir after all. Without another word, Mihir strode from the table and toward the doors of the veranda. Tolovan stepped out and looked to Ihsan — ready to do whatever his lord bade him—and when Ihsan shook his head, Tolovan let Mihir pass and then struck a measured pace toward the table where his King was still sitting. “It’s rather too soon to tell.” Ihsan stood, looking over the half-eaten fare. “Too soon indeed.” He said these words, and yet he smiled as he stood and strode purposefully toward the palace. 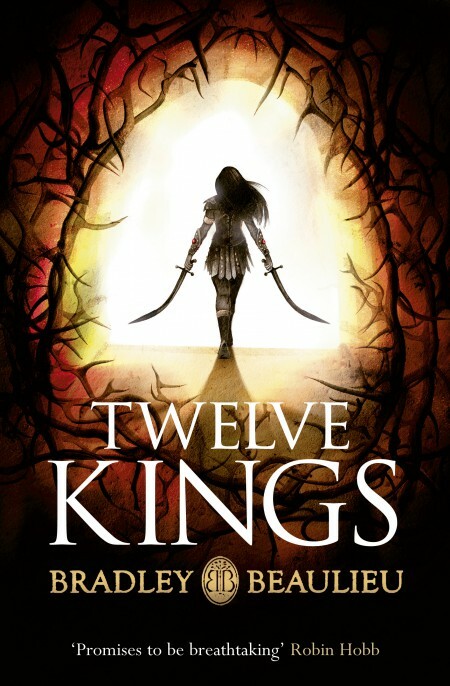 Twelve Kings is out now in the UK and US. For more on Beaulieu’s writing and novels, be sure to check out his website, and follow him on Twitter and Goodreads.